Though he might be best known for his platforming antics, Kirby is no stranger to spin-offs – from racing and pinball to madcap mini-golf, the pink puffball and his friends have been genre-hopping happily since 1993. 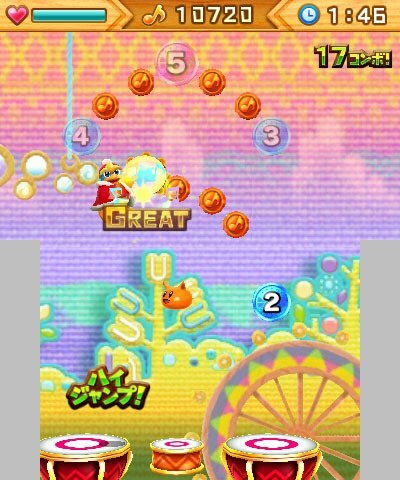 Lately, Dreamland’s semi-benevolent King Dedede has spent some time in the spin-off spotlight himself, with his musical mini-game Dedede’s Drum Dash included in Kirby Triple Deluxe. 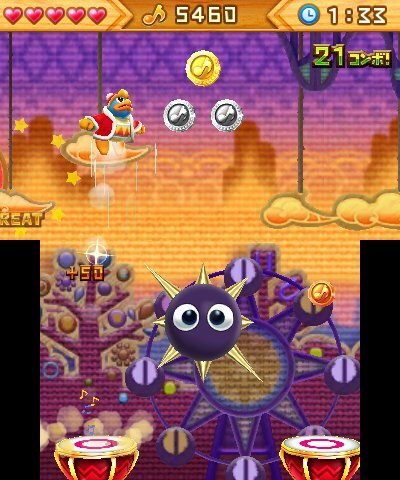 Now expanded into a full eShop release as Drum Dash Deluxe, Dedede’s download debut is a lovely little game with fun tunes and a unique feel that will have rhythm fans jumping for joy. 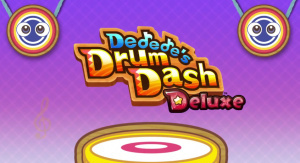 Just like the original mini-game, Drum Dash Deluxe sees players controlling Dedede as he hops and claps to the beat, collecting coins, avoiding enemies, and dodging obstacles on his way through each timpani-filled, song-based stage. Everything needs to be done on the beat, though it’s more of ‘musical platformer’ than a traditional rhythm game – the goal is simply to reach the end of each level, where you’ll earn either a bronze, silver, gold, or platinum medal based on your performance. While it sounds simple enough, Drum Dash doesn’t feel quite like any other rhythm game out there. It controls very differently, and that’s part of what makes it so much fun to play. 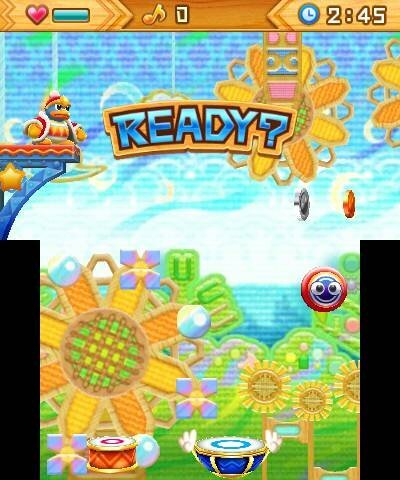 For starters, Dedede doesn’t auto-dash in the style of Runner 2 or HarmoKnight; instead, you control his movement manually with the Circle Pad, just as you would in a traditional Kirby game. 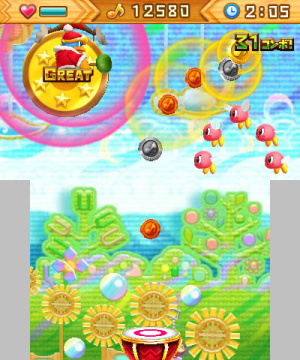 While holding the Circle Pad to the right is certainly a safe default, particularly in the earlier stages, later level designs make clever use of Dedede’s analogue abilities: sometimes you’ll need to backtrack over a drum or two to pick up coins, or speed up or slow down to avoid an enemy – and when you bounce off of the new ‘propeller drums’, you’ll need to feather the Circle Pad carefully to avoid missing the moving target on the way back down. Along with seeing Dedede safely through the stage, you’re also in charge of his three different jumps. Landing on a drum will automatically send Dedede into a low-height hop – just high enough to arc over the adjacent timpani without worry. If you press ‘A’ as you land, however, you’ll perform a High Jump – and if you press ‘A’ while landing from a High Jump, you’ll shoot up into an even higher Super Jump. Levels are built around this three-plane system, with coins arranged in series of elegant arcs that necessitate staying a step ahead at all times: if you want to Super Jump up to a gold coin above you, for instance, you’ll need to have already High Jumped off the previous drum. Of course, since Dedede only moves when you tell him to, you’re free to bounce safely in place until you reach the height you need, but time bonuses (and breakable drums!) encourage you to plan ahead. However high you jump, you won’t want to forget to clap – another of Dedede’s trademark techniques involves banging his trusty tambourine on the backbeat, by pressing ‘A’ at the apex of each leap. You’ll earn either a ‘Good’ or a ‘Great!’ based on your timing, and a substantial bonus if you manage to hit every single beat in the stage. This manual beat-keeping adds another fun layer to the game; it’s easy when you’re locked into a steady groove, and acts as a rhythmic anchor to help keep you in time, but it’s also one of the easiest inputs to flub when things get frantic. If you’ve played the original Drum Dash, of course, none of this will surprise you – the core gameplay remains the same, and it’s just as fun here as it was in Triple Deluxe. This stand-alone version definitely deserves its ‘Deluxe’ designation, however, and returning players will find plenty of surprises in store. The songs are all new, for one, so there’s no redundant content – the fourteen stages cover the original and secret (significantly harder) versions of four tracks from Triple Deluxe and one each from Air Ride, Return to Dreamland, and Super Star’s Revenge of Meta Knight. 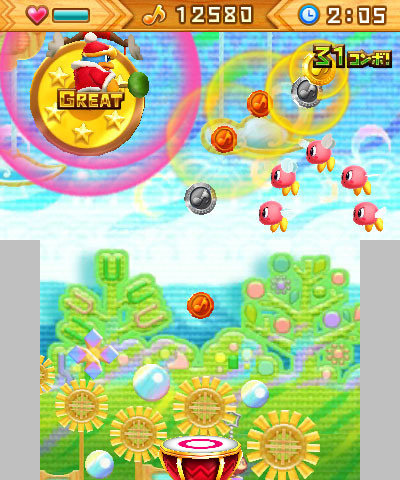 You’ll also find several new mechanics introduced as you progress through the game, including gongs that make new coins appear when hit, numbered coins that need to be collected in a certain order, blindfold banners that partially block your view of the stage, rotating drums with spikes on one side, and Dedede-propelled drums that move forward as you bounce. They’re all fantastic additions that fit in perfectly, and go a long way towards making Drum Dash Deluxe feel like a fully fleshed out experience. 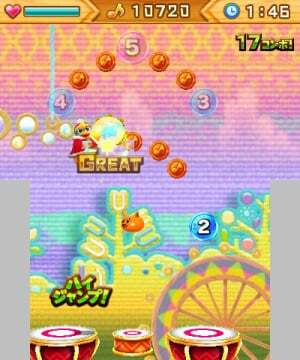 Along with these tricky new obstacles come some significant tweaks to Dedede’s defenses: a relatively lengthy (at least in the ‘Normal’ stages) lifebar replaces the original’s heart system, and falling between the drums no longer immediately ends the level – as long as you’ve got enough life to spare, you’ll just lose a few seconds and bounce right back to the last checkpoint. 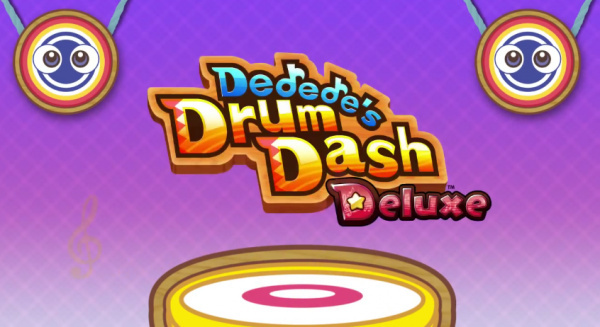 These changes – along with the thoughtful level design – give Drum Dash Deluxe a much-improved difficulty crescendo: the first half of the game will feel like a cakewalk for veteran drummers, but it does a great job easing new players into the action, and setting them up for the considerably more challenging hidden levels found in the second half. The final secret stage in particular is a masterpiece of reflex-testing rhythm gameplay, tying everything together into one gloriously complex coda. Rounding out the Deluxe additions is the new Replay Jam mode, which lets you watch and remix your most recent performance with a suite of sound pads at your fingertips: hi-hat, cymbals, hand claps, and toms are mapped to the face buttons, the Circle Pad acts as a record to scratch, and the shoulder buttons cue Casio-style barks and bells. While you can’t save or share your creations – Miiverse integration would’ve been a nice touch – it’s still considerably more fun than a normal replay mode, and feels right at home in a Kirby game. Finally, if you’ve played Kirby Triple Deluxe (and still have the game set as one of your twelve registered StreetPass titles), you’ll get a nifty bonus: Kirby, Meta Knight, and Waddle Dee masks for Dedede to wear on his Drum Dash adventure. These Dreamland designs add a cute touch and some additional sound effects, but new players needn’t feel left out; you’ll also unlock other masks as you work your way through the game. It’s worth noting that that won’t take very long – the first credits sequence appeared in just under a half hour, though finishing every stage took closer to two. If you’re the kind of player who likes to revisit rhythm games for scores, however, you’ll be in heaven; it's incredibly easy to sink hours into the game in pursuit of perfection and the elusive final platinum medal. The analogue movement also means that high scores involve a lot more than simply getting all ‘Perfect’s; there’s room for creative play, and you can strategize and come up with new routes as you bounce your way through the stage, shaving seconds off your time and shooting for top scores. Even if you’re not normally one for score chasing, you may well find yourself drawn back into Drum Dash Deluxe’s world on charm alone – as is the Kirby way, this is an adorably appealing game from start to finish. The graphics blend the clean, colourful style of Triple Deluxe with beautiful, Epic Yarn-esque backgrounds, and Dedede is full of personality – witness the sassy wink he gives the camera each time he hits his tambourine with perfect timing. 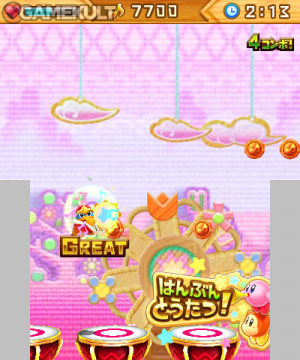 The stereoscopic 3D effect looks great too, and is subtle enough to not feel jarring as Dedede leaps between screens. Most importantly, the music is fantastic. Each top-notch Kirby tune present has been reorchestrated in Drum Dash’s unique style, with a focus on acoustic instrumentation with the likes of piano, double bass, tin whistles, and melodica that'll remind you of Epic Yarn. The only complaint is that every level shares the same 4/4 time signature, and while that’s admittedly true of an overwhelming majority of Kirby classics, there’s definitely more to draw on; we would have loved to have seen a Sky Waltz stage with extra hang time on the latter two beats, for example. As brilliant as the included selection of levels and songs is – and it really does feel like a complete package – we wish there were more in general. The gameplay’s certainly strong enough to support a comprehensive, Theatrhythm-style celebration of Kirby’s considerable musical legacy, and we’d be quite happy to see Dedede trade in his hammer for a tambourine more often – hopefully this won’t be the last musical dash he makes through Dreamland. Rhythm game fans rejoice; Drum Dash Deluxe is a hit. Short but very sweet, it offers wonderful tunes, clever levels, and tons of trademark Kirby charm. It’s also an excellent expansion of the original mini-game, with all new stages and lots of fun gameplay tweaks. Players who enjoyed Drum Dash’s Triple Deluxe debut will absolutely love it, and anyone looking for a fresh take on musical platforming will have a blast. Dededelightful. When is it out in the EU? Really, a 9 out of 10? Can say I'm shocked, but I doubt I'll ever get this. I'm surprised at the score, I was expecting it to feel a bit lacking. I don't own Triple Deluxe but I'm definitely hoping this gets an EU release. Cool, though I have yet to get Harmoknight. LOL. I really enjoyed this minigame in Triple Deluxe, even though getting all S ranks murdered my thumbs LOL. I have the game and enjoying it but even that score shocks me. X-D I'd personally say it's more of 8/10 so far but that could change as I get further along. Great review though and I'd definitely recommend the title to anyone that's curious. Eh. I didn't really like this mini game on Kirby Triple duluxe. I don't know why. I just didn't. I suggest to everyone to just go for full game. It's definitely worth it. I'm just gonna get triple deluxe in a couple weeks. Great review! ......meh, I'll pass. Not that I don't like it but I just played Triple Deluxe and I just don't feel like it. Still, great review! I wasnt the biggest fan of this in TD, might get it if it goes on sale some time. I'll download it now!!! This rhythm thief's got more than enough to keep him busy until Smash, especially since Curtain Call will have button controls! I own the game and it's worth a 9. Gameplay definitely doesn't feel small because I'm warning you, it's extremely hard. Really? You rated this game higher than Kirby TD? I didn't play Kirby TD but I got this and love it! It's really difficult get Platinum in all 14 levels , took me around 7 hours but it's a very cool rhythm game. I bought this before even buying Triple Deluxe. It was AWESOME! In fact so awesome, that this mini-game is what made me purchase Triple Deluxe in the end, only to have another 4 stages. This mini-game is THAT good. Hence why I was so sad when I finally got my 14 Platinum and 2 Platinum trophies I wish to have a game with this engine with 50+ songs from the entire Kirby history. 10/10 for me. Great review. This is an awesome game. I've been waiting for this review. Looks like it's a must-buy! I know some people will disagree with me on this, but I preferred Drum Dash as opposed to Kirby Fighters. It was just more fun. I liked this game, but I can't agree with that score. For $7, you're only getting 7 songs, and 14 levels total. For double the price, you get 58 levels, varying styles of gameplay, and even some PokéMon music to play to in HarmoKnight. I'm not trying to compare the two games, but rather the amount of bang you get for your buck between the two. Drum Dash could either use more content or a lower price point. That aside, I give it 8/10. As frustrating as it was trying to get a platinum medal on every stage, it does feel rewarding to see those two platinum trophies on the title screen. I bought TD but never opened it, so I am curious about this one because I love rhythm games in general. I wonder if I should pick it up. @ShadJV The difficulty curve is a lot smoother. You're better prepared for the final level when you reach that point. 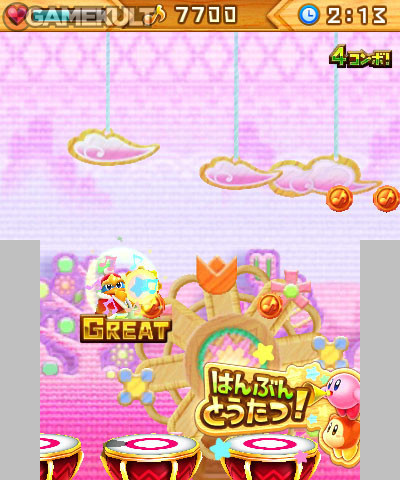 Plus, after beating the game, the fourth level of Drum Dash in Kirby TD somehow seems a fair bit easier. This game is extremely underrated. This deserves the score it got. I guess this got the score it was gotten because it was good for what it was meant to be, that and it was cheaper then TD so you got your monies worth. I love rhythm games and, I must say, this one snuck up on me (in a good way). Anyone care to compare its level-of-fun-and-charm to HarmoKnight? I honestly couldn't stand this mini-game in Triple Deluxe, but I love rhythm games. I truly wanted to like it, honest. @Phantom_R This. this, so much. I downloaded this game a few days ago and must admit, it has quickly become a fan favorite. Love, love, love it 100%. By the way, this review is awesome and if I didn't own the game already, this review would have convinced me to purchase it. I like the game quite a bit but it seems... Lacking in a few ways. I don't think it would have hurt the game to include the songs from Triple deluxe, especially since those songs are more iconic and catchy. Price point is a bit steep imo. I'd recommend waiting to see if it goes on sale. But still a great game. If price/value is included in my score, 7/10. Otherwise I agree with NL. I want Kirby 3DS to go on sale for 29.99 in the eshop!! Sounds good. But 7 Dollar/Euro may be a bit much for such a short game. Ah well, maybe I download it someday in the future. OUT IN EUROPE ON FEB 13th!! How blocks does take up? 9 out of 10? Should Yoshi's Island be rated 9999 out of 10, then? Or do you guys do joke reviews now?